Three bright planets and the crescent moon make for a spectacular sight this Friday evening, July 16. On Wednesday the Moon will be just below Venus, and on Thursday just below Mars. Full Story. Three of thebrightest planets, Venus, Mars, and Saturn, are gathering in thewestern skyjust after sunset. This week, the slender crescent moon pays eachplanet avisit in turn. On Wednesdaynight, July 14, the moon will be directly below the brilliant planetVenus. Ifyou look at Venusthrough a telescope, you may be surprised to see that itlooks like a fatgibbous moon, 65 percent illuminated, while the moon is a slendercrescent just15 percent illuminated. How can this be? It isbecause Venus is on the far side of the sun, so that it is ?front-lit?whereasthe moon is between us and the sun, so is ?back-lit.? Think of the fourobjectsforming a ragged line: Earth, moon, sun, Venus, with the sun somewhatoff tothe right. But themoon's encounter with Venus is the just the beginning of its planetarytourthis week. (This graphic shows how to see the moonas it visits Venus,Mars and Saturn). By Thursdaynight, the moon will have moved in its orbit around the Earth so thatit isdirectly below Mars, which should look distinctly orange-red to thenaked eye.Mars, too, is on the far side of the sun, and very tiny in even the mostpowerful telescope. 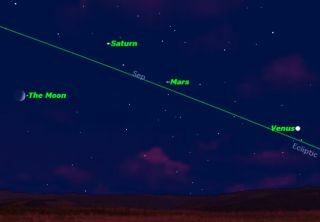 Finally, onFriday night, the moon will have moved to the position shown in theimage, tothe lower left of Saturn. Saturn has been a disappointment this year totelescopic observers because its famous ring system has been almostedge on toour view, and so almost invisible. Notice howthe moon is significantly below the ecliptic, thepath taken by the sunin its apparent travel through the sky, while all three planets aresignificantly above the ecliptic. This is apowerful demonstration of how the moon and planets do not all travel inthesame plane. Their orbits are all slightly tilted relative to oneanother. The orbitof the moon is tilted more than those of the planets, whichexplains why itlies so low relative to the ecliptic, and why it so rarely passesdirectly infront of any of the planets. Although youmay not notice it over the next few nights, the three planets arethemselvesdrawing closer together, heading towards a triple conjunction in thefirst weekof August.